Reusable bottles are not just cool, but essential! Dopper tells us why. Ahead of our event on Thursday May 23rd, we thought we’d catch up with one of our panelists: Merijn Everaarts, Founder of Dopper. We’ll be taking over BMW i Electric Car showroom on Park Lane for an evening of talks, music, panel discussions, ethical stalls and networking. Come join us! Also participating in the event: Ecover, Budwesier, BMW i, WWF, Goodwings and Loop. We’re keen to find out how these big players are setting the standards for sustainability and influencing other companies to follow suit. Please could you tell us a little bit about Dopper and why Dopper was created? HOW IT STARTED: In 2009, Dopper Founder Merijn Everaarts saw a documentary about the plastic soup. And instead of just feeling shocked and moving on, he decided to take action. He started to wonder: why would you buy bottled water, when you have excellent water coming straight from your tap, for free? He launched a design competition for the perfect sustainable water bottle and BANG! In 2010 the Dopper Original saw the light of day. What’s your mission as an eco-friendly brand? Dopper is about crystal clear water. In every ocean, from every tap. But sadly, when it comes to ocean conservancy, our planet isn’t doing too well. And that’s an understatement. Every year, 8 million metric tons (almost 9 million US tons) of plastic ends up in our oceans. And it doesn’t help that we continue to purchase 1 million disposable water bottles worldwide, every minute of every day. There has got to be a better way. Right? This is why at Dopper, we make refillable water bottles. Uniquely designed – featuring an integrated cup that serves as its cap – with a Cradle-to-Cradle certificate. But Dopper does more. Like promoting the use of tap water, supporting clean water projects in countries like Nepal, and sparking a debate on our throw-away society. All of these projects, ranging from awareness campaigns to partnerships, are 100% focused on our mission. How are you helping people around the world have clean access to water? 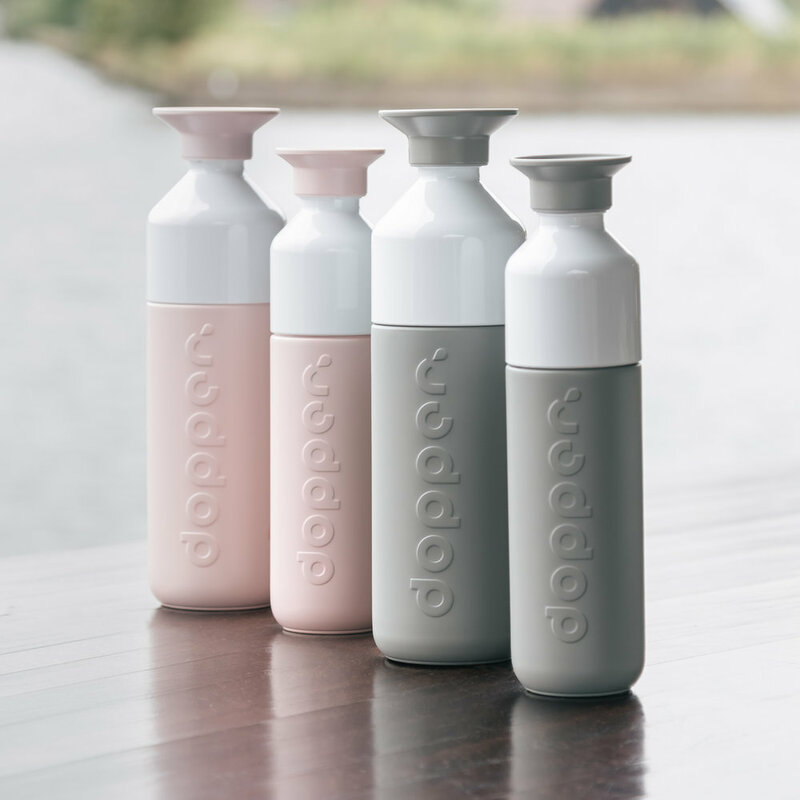 Financed by 5% of Dopper’s net turnover, Dopper Foundation invests in safe drinking water and solutions against plastic pollution that go beyond the bottle. How, you ask? With a focus on knowledge, inspiration and change! Knowledge about an issue underlies its solution. That’s why Dopper facilitates research and education about water and waste. For example, the Dopper organises the annual Change-maker Challenge: a competition to encourage students to focus their graduation research on issues regarding clean drinking water and plastic pollution. How are you inspiring other types of change-makers? Want to change behaviour? Move someone on an emotional level! Dopper Foundation joins forces with artists and fellow change-makers to inspire people to step into a more sustainable lifestyle. In 2018 the Foundation collaborated with visual artists, singers, writers and actors to spread the message about plastic pollution in New York. All art forms were part of the Plastic Bridge Project: an educational tour which revolved around a replica of the Brooklyn Bridge made with thousands of single-use water bottles. Clean drinking water is vital if we want to replace bottled water with a sustainable alternative. Ever since our first bottle was produced, Dopper Foundation is collaborating with Simavi on drinking water projects in Nepal. But the Foundation is also broadening its scope with other initiatives and entrepreneurs that are helping increase access to safe drinking water in Nepal. The 2020 goal is to provide access to clean drinking water for 100,000 people. Ambitious? It sure is! Your one-stop shop for slow fashion!